Maine Gov. Paul LePage delivers his State of the State address in in the house chambers in Augusta Tuesday Feb. 5, 2013. AUBURN, Maine — Gov. 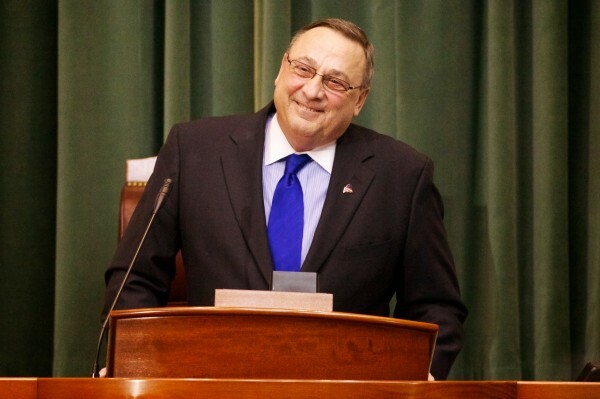 Paul LePage brushed off allegations Tuesday that he pressured unemployment claims appeals examiners last month in an effort to skew their decisions in favor of business owners. LePage, who had just met with students at Fairview Elementary School’s Maine French Heritage Language Program, told reporters repeatedly that “nobody” was pressured by him at a March 21 luncheon at the Blaine House. Published reports have shown that the U.S. Department of Labor finds Maine’s unemployment appeals hearing examiners are rated above the national average for equitable hearings. Having been an employer in Maine, LePage said he was surprised to learn that. “Attorney Webbert, he’s pulling the wool over Maine people’s eyes” LePage said Tuesday, speaking publicly for the first time since the allegations surfaced two weeks ago. “I think Webbert made it up,” LePage said. A Sun Journal investigation cited sources in an April 11 report that LePage had called hearing officers at the Division of Administrative Hearings at the Maine Department of Labor to a mandatory meeting at the governor’s mansion where he scolded them for finding too many unemployment-benefit appeals cases in favor of workers. They were told they were doing their jobs poorly. Afterward, they said they felt abused, harassed and bullied by the governor, according to the newspaper’s sources. LePage said Tuesday that Webbert must be fabricating the allegations because none of the hearing officers has stepped forward and spoken publicly. In a phone call last week with Seth Harris, acting secretary of the U.S. Department of Labor, LePage said they spoke only about “fairness and “equity,” not partisan politics. Harris “said there was no investigation,” only routine auditing, LePage said. An email to Webbert from the U.S. Department of Labor’s Office of Inspector General said his complaint had been forwarded within that department to the Office of Labor Racketeering and Fraud Investigations. LePage said Tuesday he had named co-chairmen of a blue ribbon commission charged with reviewing Maine’s Unemployment Compensation System. The commission will include representatives of employers and employees, LePage said. Co-chairman Daniel Wathen served for two decades on the Maine Supreme Judicial Court, half of that time as chief justice. George Jabar, a Waterville lawyer, serves as a commissioner in Kennebec County government.